Like many of our clients, Cornerstone Pros – Air Conditioning, Plumbing, Electrical found itself in a saturated market, and struggling to stand out. Its current branding failed to translate the company’s value proposition of old-school customer service and quality workmanship. Compounding the issue was the recent expansion into the plumbing sector, which did not appear in the branding. 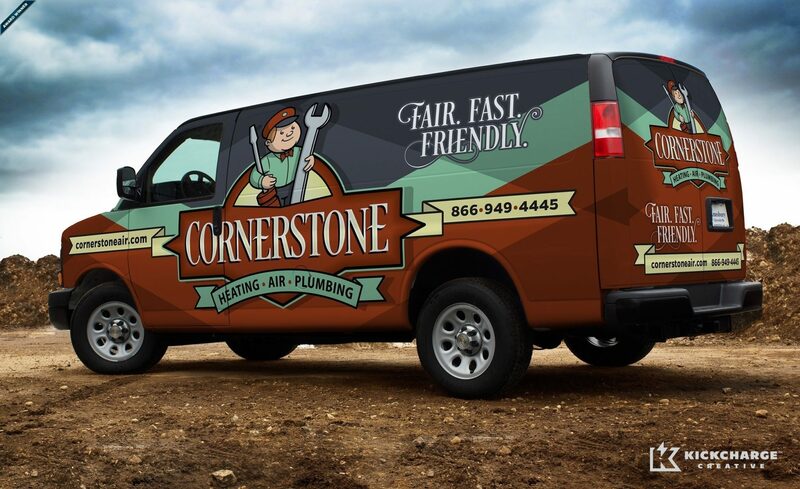 Cornerstone Pros came to us for a bold, retro look for their logo, truck wrap and website, which would help differentiate themselves from the competition. “We approached KickCharge Creative because we liked the retro look that they had produced for other air conditioning companies,” said Dana Spears of Cornerstone Pros. 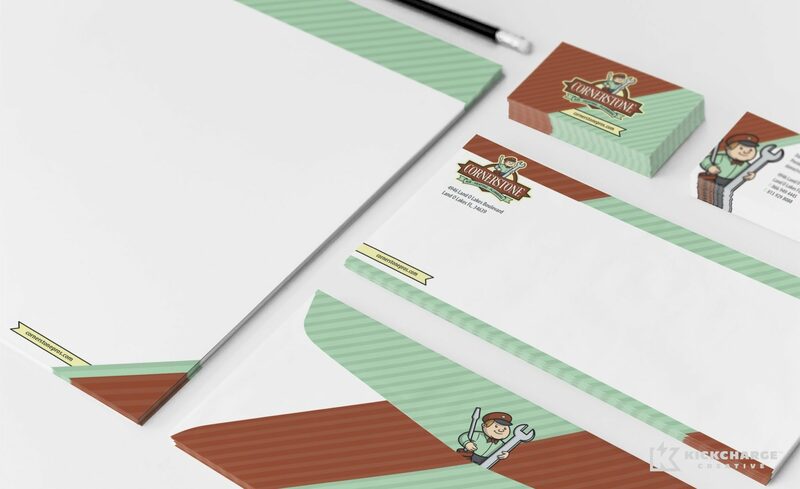 To present the wholesome values of yesteryear, we fashioned a retro brand image with a vintage color palette of green and brown, and an icon featuring a smiling serviceman sporting a bowtie and eager to work. Rounding out the logo, an upscale font communicates premium service. The new brand identity made a splash in the market with a vehicle wrap that prominently features the new logo and its slogan—‘Fair. Fast. Friendly.’ which reinforces the theme through vintage flourishes on the font. Those same vintage embellishments are extended on Cornerstone Pros’ award-winning website, where we added to the old-school feel by making the imagery appear as if it came from an instant camera. The website received an award in the Graphic Design USA 2014 American Web Design Awards, and in June of 2014, was named Best Consumer Web Site by the NJ AD Club, as well being awarded Best in Show for the Digital Media category. Enhancing Cornerstone Pros’ image was simple, because the company had a strong foundation of old-school values and craftsmanship on which to build. The company now holds a unique place in the market, and is positioned for extreme growth. 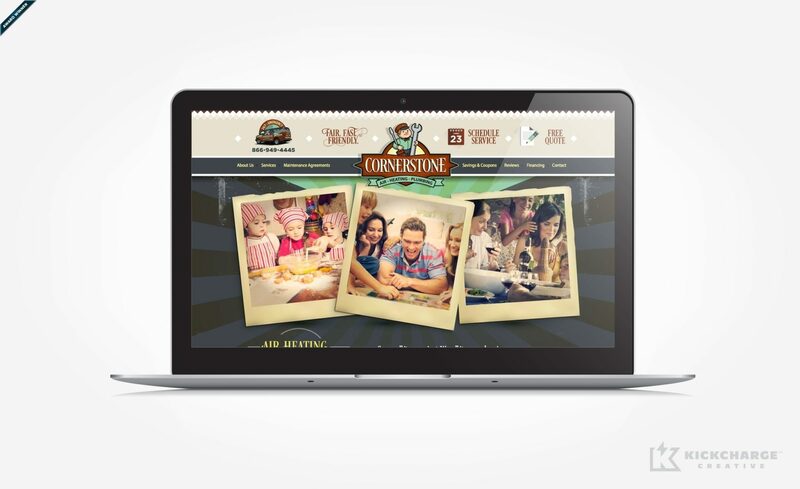 Since launching their new brand, Cornerstone’s sales increased by nearly $100,000 each month. In addition, the new website contact form generates 30-60 more leads per month. With a unified brand image presented to customers in the market and online, Cornerstone Pros has already begun the next stage of growth. “The quality of work and designs that were created by KickCharge Creative took us to the next level,” Dana said, relaying that revenue for the air conditioning division has increased by six digits every month since the changeover.